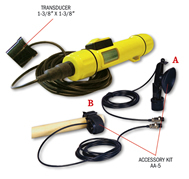 Easy to use, portable, sonar depthsounders. Get accurate depth from your boat or dinghy with one flick of a switch. Great for scuba divers too! $208.00 plus shipping. Call 540-854-6749 to order. $263.00 plus shipping. Call 540-854-6749 to order.